This past week has just been another bad one for US President Donald Trump. As his ratings keep falling and the media has a field day mocking his every move, it’s unfortunate that his family sometimes gets dragged into it. Case in point, the recent solar eclipse. Though the White House was not in the Path of Totality, a video of the President looking directly at the eclipsed sun as an aide shouted “don’t look!” went viral. And the person who got eclipsed in the mockery was Barron Trump. The youngest child of Trump and Melania, he is just a boy. Even during the Presidential campaign, there were internet trolls accusing him of having autism. More recently, they’ve been calling him out for his choice of clothing. 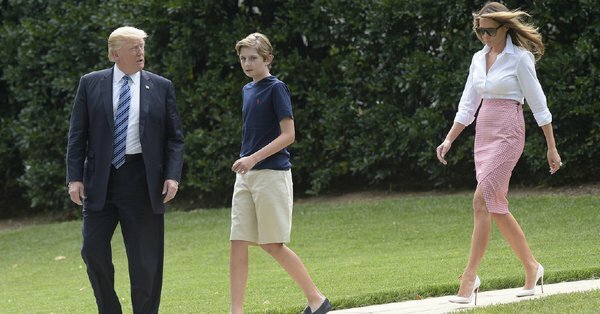 Barron has been wearing t-shirts while boarding Air Force One or hanging out on the balcony at the White House. Though Donald Trump probably deserves his fair share of name calling, it is unfair to drag a child into it. And that is exactly what Chelsea Clinton, daughter of Trump’s opponent, Hillary Clinton said on Twitter. While Trump was giving a speech in Arizona with his followers chanting “lock her up” towards Hillary, Chelsea Clinton was being the kickass woman she has long been known as. Chelsea Clinton herself knows what it’s like to be under media scrutiny, having grown up in the White House with Bill Clinton playing the role of both her father, and President.